Quite a few Target CDs can be found whereby the catalog number is the distinguishing element between the different existing variations. 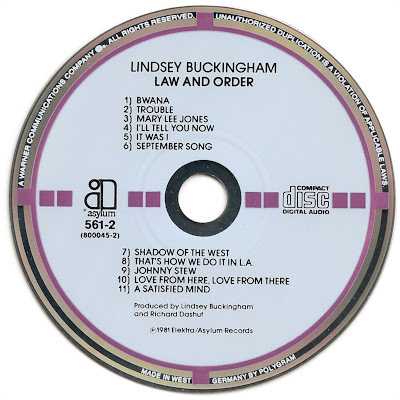 Law and Order by Lindsey Buckingham is such a Target CD. Below the variation with catalog number 561-2 is shown. The other catalog number that can be found on this CD is 64561-2. Note that the variation listed here says MADE IN WEST GERMANY BY POLYGRAM whereas the CD with catalog number 64561-2 is only known with MADE IN WEST GERMANY (with a break between IN and WEST) printed at the bottom of the disc, though it would not surprise me that both catalog number variations also exist with other marginal inscriptions.